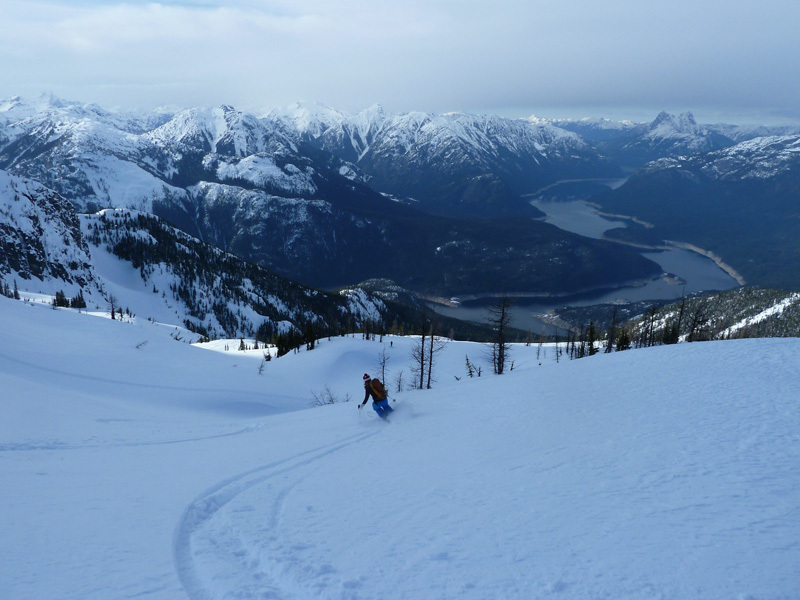 Ruby Mountain: an isolated multi-peaked massif rising over 6000 ft above the long-flooded valley of the Skagit River in the North Cascades, a near-island of a mountain surrounded on all sides by deep valleys filled with reservoirs and flowing with creeks. Despite its modest summit elevation of 7408 ft, Ruby is the 21st most prominent peak in Washington state, extending about 3900 ft above Fourth of July Pass on its southern flank. An excellent photo of the north side of Ruby Mountain from Ross Lake, linked from SummitPost.org (photo by Redwic). Ruby had been on my agenda for well over a decade, mainly for the 360� summit views and originally as a late-summer day hike objective gaining 6200 vert from Colonial Creek Campground via Fourth of July Pass and then an abandoned trail up the south ridge to the summit. 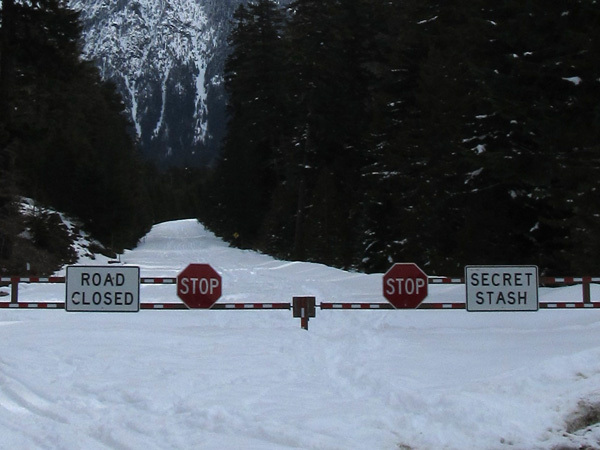 But it was also clearly a fine ski objective too, with 5300 vert on the north side starting from the SR 20 winter road closure gate at 2100 ft near Happy Creek. The years passed, other peaks and other trips always won out on any given day, and still I had never yet made an attempt on Ruby. Four-shot panorama looking north from around 6300 ft, with the Picket Range at left, Ross Lake at center, and Jack and Crater Mountains at right. I'd been thinking about Ruby again for the past week or two. After a fairly big day breaking trail and skiing north-facing powder on Friday (see March 23, Tatoosh Powder & Solitude), we began to make plans for Saturday during the drive home. The forecast looked to be mostly sunny, so we had to ski something, somewhere. What about Ruby? It seemed fairly ambitious to undertake a second consecutive big vert day, given that we wouldn't get home to Seattle from Rainier until almost 11pm. But a March 22 Ruby Mtn TR on TAY (now vanished) suggested that a skin track was in place up to at least 6000 ft, which might ease the trail-breaking work for us. Jessie was stoked on the idea of Ruby, and so were Elliott and Paresh who would be joining us for Saturday. The plan was set, it would be new ground for all 4 of us. Didn't want to get up too early, so we planned to meet and leave Seattle at 7am. 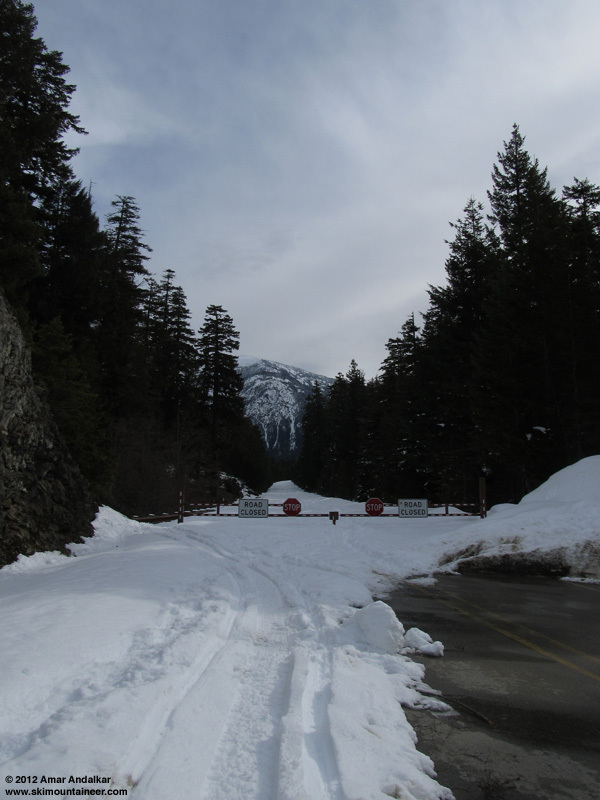 We hoped to be skinning up from the SR 20 road closure gate around 10am, but it ended up a bit later as usual. Snowdepth at the 2100 ft closure gate was about 2-3 ft.
Less than 20 minutes of skinning along the snow-covered road brought us at 11am to some mangled tracks leading off into the woods, which eventually turned into a rough skintrack and was soon joined by an additional newer skintrack from the left, forming a mostly-smooth highway through the forest, staying on the east side of Happy Creek. Fairly easy travel, although overly steep at times, and we figured there had to be several parties ahead of us on the route on such a nice Saturday, especially given our leisurely start time. However, there would turn out to be only a single party of 4 ahead of us (that we never saw going up or down), and another party of two skiers who started just after us from the trailhead. First view of the summit of Ruby, from the 3400 ft clearing. The long skin through the forest was interrupted only by two major open areas, the first a flat meadow near 3400 ft and the second a sloping meadow near 3900 ft which had a steeper slope extending up to about 4200 ft. Although the day was warming quickly, partly cloudy skies kept it reasonable, and the skin up through the woods was largely free from annoying snow drips. A few major tree bombs did land nearby, some too close for comfort, and the snow surface was cratered several feet deep in many spots from very large impacts. Ross Lake with twin-headed Hozomeen Mountain beyond, with Jack Mountain at right. It was mid-afternoon by the time we broke out of the forest into the open subalpine near 5600 ft, with expansive views stretching off to the north above Ross Lake. We took a long lunch break after 2pm, only to have the toe lever on one of our group member's Plum bindings snap off as we clicked back into our skis. Was this the end of our day? Luckily, the boot seemed secure enough in the toepiece to keep skinning up, even though it was now in ski mode permanently with no way to lock-out toe release for skinning mode. As we continued up above treeline, past the ghostly armatures of numerous needle-less larch trees, we discovered that another party had extended the skintrack from 6000 ft all the way to the summit, so we had a fairly easy highway to follow the whole way up today. 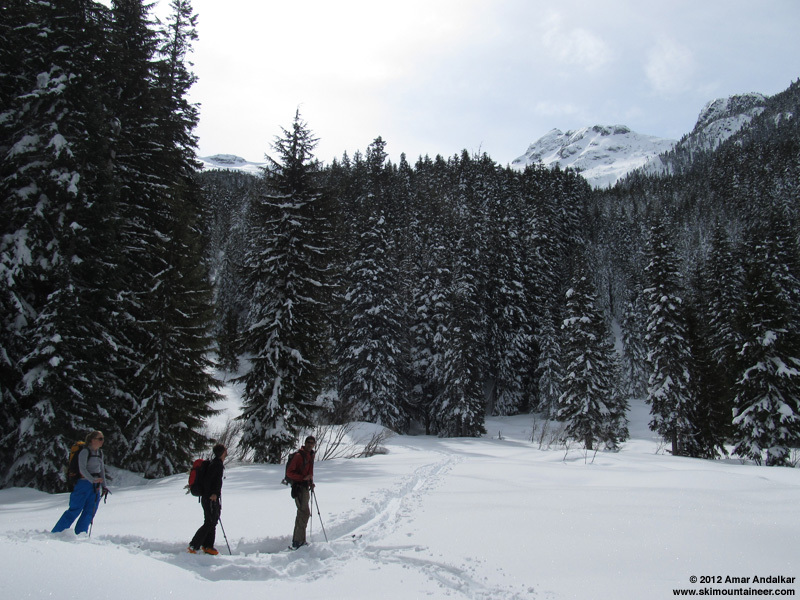 A sharp contrast to the previous day's untracked trailbreaking in the Tatoosh, for two of us at least. We had brought foot crampons in addition to ski crampons, but neither were needed this day, and the entire route from trailhead to summit is quite skinnable (assuming sensible route-finding) with no need to boot up any part. Our progress through the alpine was slowed only by the need to take innumerable photos in the glorious scenery. We finally topped out at 4:30pm, with a light SW breeze and moderate temps in filtered sunshine. It looked like a snow squall was moving quickly towards us from the Pyramid-Colonial-Snowfield Peak massif, but we got only a few snowflakes as it passed by to our north and then full sunshine returned. Paresh far ahead of us along the SE ridge leading to the summit. 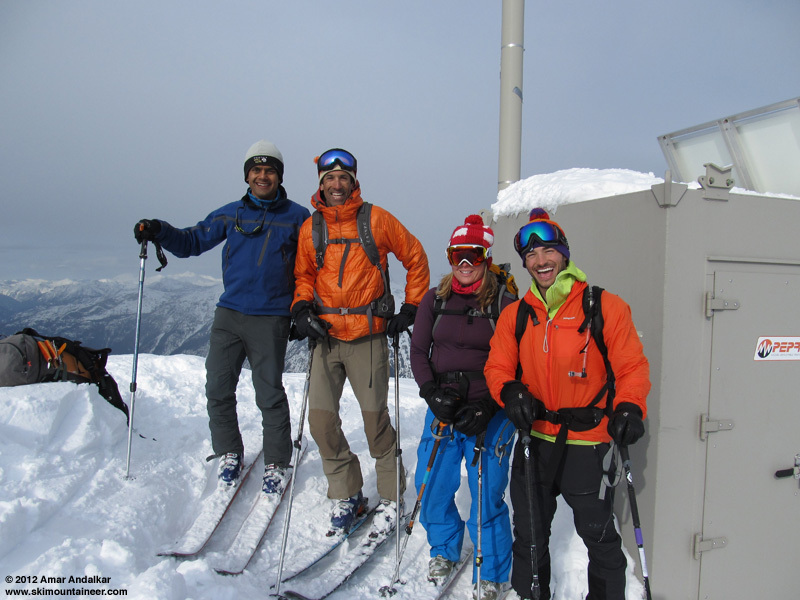 The summit of Ruby Mountain has an amazing 360� view of the North Cascades, marred only by an antenna and small metal electronics building perched right at the top. We skied off the summit around 5pm, with windpacked powder and some crust along the initial ridge. Only about 4 tracks from the previous day were in the summit region, so the vast expanses of the upper bowls were basically all untracked. Being north facing it was all still powder too, really sweet in spots, a bit wind-affected in others. Untracked powder and larches -- like a little piece of the eastern Cascades, dropped here 20 miles west of the Cascade Crest. We aimed for a nice-looking protected gully to the east of our ascent route, which kept the good-quality powder going down to about 5200 ft.
As we descended into the mature forest, the snow quality plummeted too -- the powder was gone, replaced by sticky mush and heavy concrete, the surface scarred by countless tree bombs and drips. We eventually dropped down a very steep gully beside icicle-covered cliffs, filled with sticky but stable cement, to reach the upper 3900 ft meadow. And then the rains began -- not rain from the skies, but a rain of snowmelt from the canopy above us. A very wet and sticky ski down through the forest, with a brief respite from the rain in the 3400 ft meadow, and then back into the forest shower for the rest of the way down. The GPS track that I had taken on the way up was useful for shortcutting several lengthy parts of the skintrack, without risking getting lost in the woods. We were pretty wet by the time we finally emerged out onto SR 20 once again, but the dampness and bad snow in the woods couldn't detract from such a great day. We enjoyed a nice downhill glide along refreezing snowmobile tracks back to the car just before 7pm, still plenty of time before sunset. Another beautiful and amazing day in the mountains to kick off the spring of 2012. Totally stoked to have finally skied another mountain that had lingered on my agenda for over a decade, and this one not even a volcano! Even better to have done it while enjoying fine powder conditions up high, and in excellent company throughout the day. Definitely a day well lived! Thanks for the idea, the company, and the trip report Amar. Great to get out on a tour with Jessie and Elliott too. 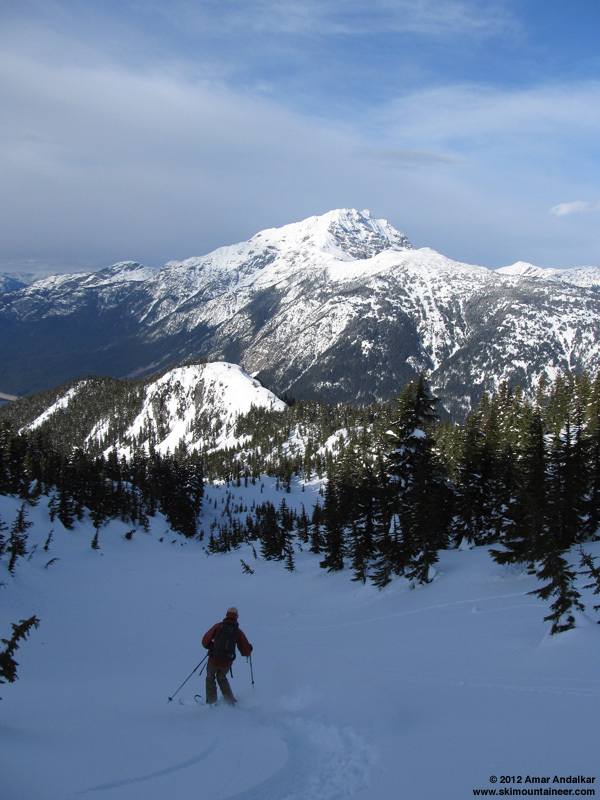 The North Cascades are always spectacular - especially in their winter-like coat. I'm the driver of the vw campervan. I want to thank you guys, especially Paresh, for looking out for us and waiting to see that we made it down. Apologies for my partner's postholing the skin track on the way down. His legs were shot, and once the snow got nasty down low, he was worried about his ACLs. Remarkable that you guys also had a toe lever breakage issue. We found that the voile strap underneath the lever on the broken Comfort binding held for the rest of the ascent. One slight correction is that the party of 4 that left the tracks skier's right of the big cornice actually descended as I was skinning up, right before you guys came up over the rise from your lunch spot. They made some pretty turns. 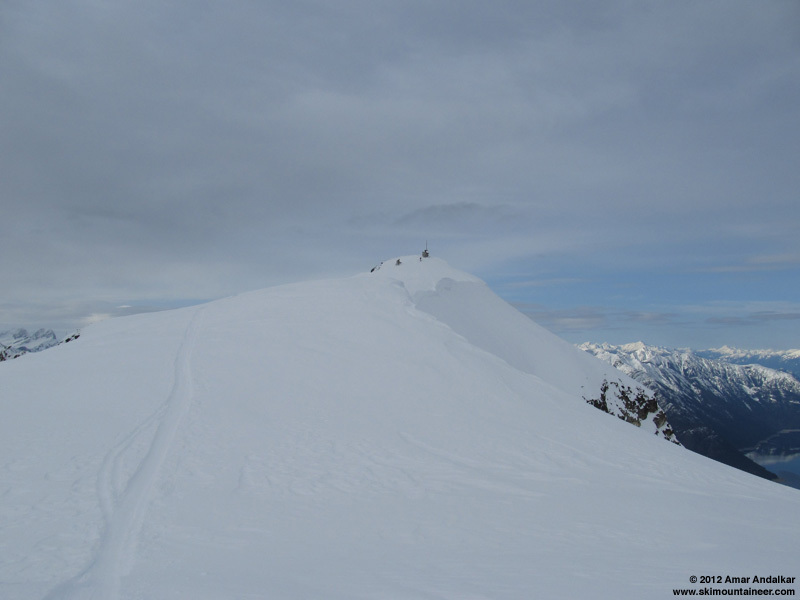 One slight correction is that the party of 4 that left the tracks skier's right of the big cornice actually descended as I was skinning up, right before you guys came up over the rise from your lunch spot.� They made some pretty turns. Thanks, made a minor edit to correct that above. Surprising that our group (or at least me) never saw them going up or down. Very nice. Got up there earlier this season and had an amazing day. 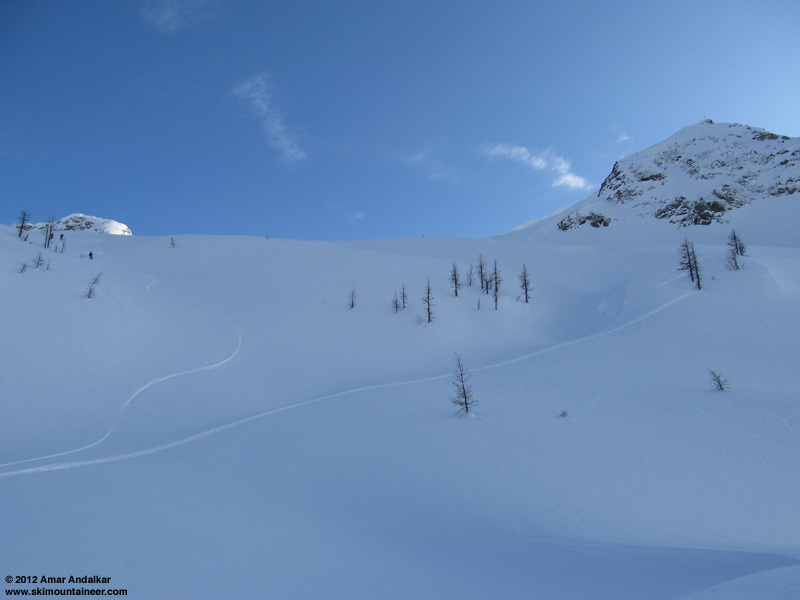 Ski access from the west side to the Happy Creek route on Ruby Mountain has already gotten more difficult now that the only skiable snow is along the sides of the road. 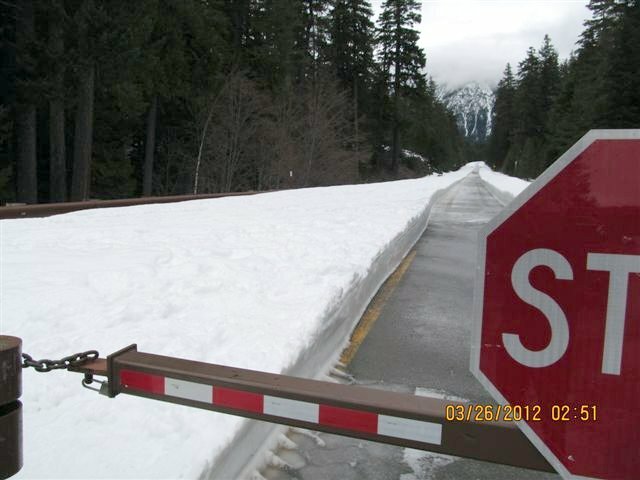 The road was partially plowed past the west-side closure gate on March 26. 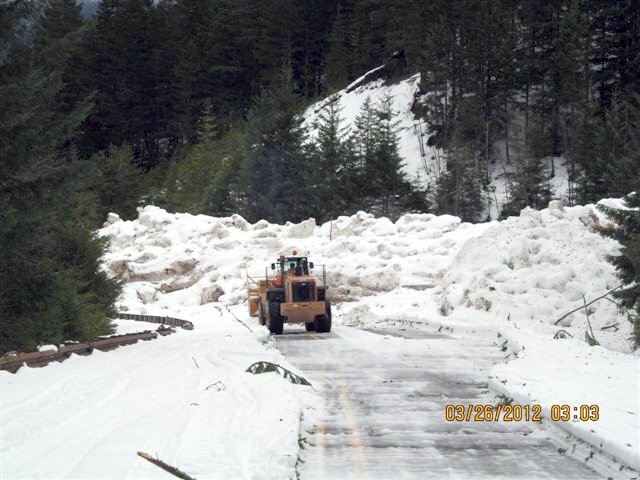 Huge pile of avalanche debris at No Name Creek (MP 137), about 3 miles east of the closure gate. 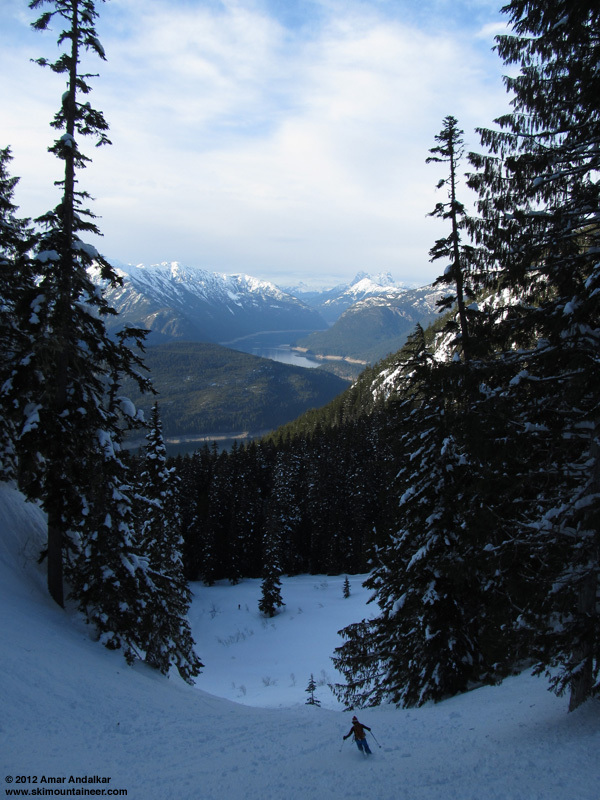 I wish I could get those pictures of the Ross Lake panorama in life size. In the past 2 days since this trip report was posted, I've been contacted via personal-message by two TAY members, one self-identifying as a Skagit Valley local and the other a well-known member of the Northwest backcountry community from the Seattle area, both requesting or suggesting that I should consider removing this TR from TAY. Since this is the first time I've ever had such a request in nearly 11 years of posting on TAY, I would like to address their concerns in an open manner here (in addition to the lengthy replies I have written to them directly), so that others who feel the same way as they do can understand my thoughts on the matter. If there is a strong consensus in the TAY community that this TR should be removed, then I would consider asking Marcus to do so, even though several hundred people have already viewed it. This cat is already out of the bag, although I believe it was already out a few years ago, as explained below. Some background: Apparently a certain group of "Skagit Valley folks" and others, who have been skiing Ruby Mountain for some number of years, have an agreement among themselves that no TRs about Ruby are to be posted, and that direct word-of-mouth is the only acceptable communication regarding it. I was not aware of any such issue with any group of people, either prior to doing this trip or before writing and posting this TR. A message from one of these people apparently resulted in the recent brief March 22 Ruby Mountain TR being removed by its author within 2 days later. However, this was not the first TR about Ruby Mountain to be posted on TAY. There are already several Ruby TRs on TAY during the past few years, although the TAY search feature is unreliable and it may not be easy for others to find them quickly, but they are online and have been for some time. I have no idea if there were other Ruby TRs here which have been removed by their authors due to pressure in the past. If Ruby had been someplace that the locals or others had personally introduced me to, I would have honored their wishes and never have written a TR. But Ruby is someplace I heard about on my own, online and elsewhere, over a period of many years, first as a hiking destination and later a skiing destination, and one that I had been intending to ski for many years. We were not brought to Ruby by another group, nor did we follow their skintrack in order to discover it. Although the existing skintrack did reduce our physical effort that day (and it was appreciated for that), our party would have made it into and up Ruby just fine without any tracks to follow. Living locally in the area ("Skagit valley folks") confers no special ownership to, nor rights upon, any nearby public lands. Perhaps because I am such an outsider here in the Northwest (having been born in India and coming to the US during infancy, then growing up in numerous cities on the East Coast and then choosing to move out to Seattle at age 22 in the mid 1990s), I feel even more strongly about that latter point. The locals may not like it, but I and everyone else have just as much right to visit (and write about, if we choose) Ruby Mountain or any other place as they do. Moreover, personally I've always despised this "secret stash" stuff, and the ill-will, selfishness, and ungenerosity that it tends to breed. It just displays so many negative aspects of human nature. Why behave like that? No good can come of it, just hurt feelings and animosity. That's probably not the spirt that we all collectively want to foster in the backcountry skiing community. I get the sense (from online posts) that the popularity of Ruby has been increasing greatly over the last several years, especially with snowshoers. A quick search on NWHikers reveals several Ruby TRs with glowing praise for the views and scenery. And as more people are now trying to complete the list of most-prominent peaks in WA, they would also be headed for Ruby. It is clear that Ruby's online exposure has been increasing for several years now at least, and thus there will be more visitors, some of them likely on skis from the N side rather than snowshoes on the NW ridge. It is inevitable that it would be so, given that Ruby is an obvious destination located directly on a state highway, and with its compelling scenic attributes. I think the reason for Ruby's relative lack of popularity so far with skiers has more to do with its 5300 vert of gain (much of it through the forest) than with any ongoing campaign of secrecy by the locals and others. It's not like most skiers can easily yo-yo multiple powder laps there in a day trip -- you have to put in over 3500 vert just to get to the bottom of the open slopes near 5600 ft. If it had only, say 2000-3000 vert from highway to summit, it would have become a far more popular winter destination long ago. Also, in many winters (not including the last several years of unusual deep snowpack at low elevations), the snowpack near the closure gate is likely minimal, and travel through the lowest parts of the forest would be a real pain (the forest floor in there appears to be made up entirely of fallen trees). All those factors will contribute to keeping Ruby relatively uncrowded. However, it has a vast amount of terrain up there, and even a several-fold increase in usage (above the level observed on Saturday, March 24) could not possibly bring it close to tracked out. Ruby can easily accomodate an increase in usage if more backcountry users choose to go there. Obviously, it won't remain completely pristine and untracked in that case, but it has not been that way for several years already during which traffic (locals, or otherwise) has been increasing. And yet it will always be pristine and untracked once again just after every major snowfall. I think my TR is but one of many small steps along an inevitable road of greater awareness and popularity for Ruby. It seems destined to be a moderately popular ski destination in winter and early spring, but the large vertical to reach open slopes and the difficult travel in the forest during normal snowpack years will conspire to keep it out of the very popular list forever. That is, unless some change in infrastructure or access occurs in the future, e.g. in the 1960s-70s, there was an aerial tramway planned from near the current winter closure gate to the summit of Ruby Mountain (see Windshield Wilderness, p.143ff), and future political climates could revive such an idea. That would change Ruby far more than any number of TRs possibly could. 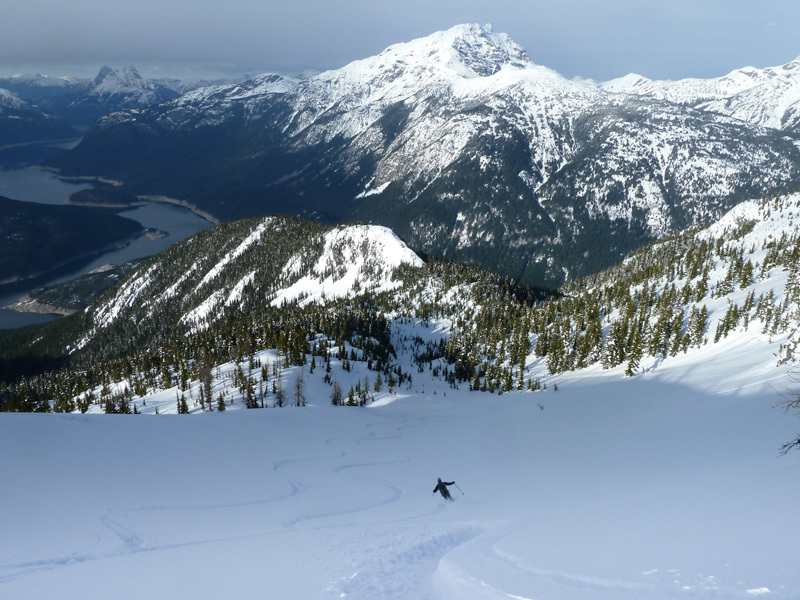 However, if more backcountry skiers visit and ski Ruby and appreciate what is special there, then there would be greater grassroots support to resist any possible future development pressure. Ironically, these various TRs and an ongoing increase in winter visitation could have the result of saving Ruby in the long term -- something which the "secret stash" folks have probably never even considered. Hopefully, this provides some insight into my thoughts on the matter to those who are concerned about this TR. Please feel free to PM if you wish, but I can't guarantee a response in all cases. Thanks, Amar, for exposing a constructive dialog -- I agree, there is no such thing as a 'secret stash', especially not on such a large, prominent, and obviously accessible peak as Ruby! It would be a shame to this community to pull your very informative TR. I have logged many trips to Ruby over the past 10 years as well (you may have even found an earlier TR of mine in your search with cascadesfreak). I have also made first TRs here in other remote areas such as Bedal around the Mtn Loop. In a nutshell, there are some amazing places in our little corner of the world, beyond the volcanoes and the passes. Some of these places however, without folks to enjoy them, may just fade for loss of access. Trails need maintainence, Log roads that access trails need constant repair, and even the highways like 20 need plowing for us to enjoy them. First get out and sample some of our more remote gems. When you find a place you love, spread the word, become an advocate and caretaker, graduate beyond the user. Amar, you did no wrong. They are fooling themselves if they think Ruby Mt. is anything remotely like a "secret stash." Anybody with a TOPO can easily discover it and put two and two together that the road access makes it a desirable winter objective. I've been up there before and it didn't require an internet TR, or a book writeup, for me to discover it. I saw it on a map and realized it had great relief and access and would thus offer awesome views. I'm hardly the only one to conclude that. If they believe that living in the Skagit area instead of, for example, the Seattle area, makes it somehow more "theirs" then that is their own problem. I'm sure plenty of Native Americans might find that claim particularly laughable. 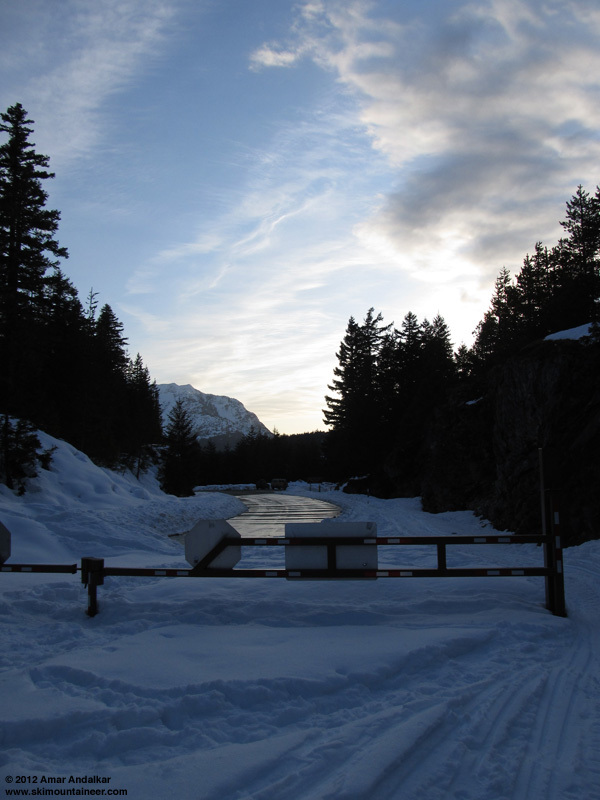 Heck, the road is drivable that far because the Skagit River has been impounded for power generation since before WW2. On a more general note, I think it goes without saying that increase dissemination of information over the innarwebs has increased backcountry traffic in general. I've noticed more people in recent years in areas that I have, in the past, had entirely to myself. Does this occasionally bother me? Sure, I think it's only natural. If I had my way, I'd prefer no internet TRs at all and a return to the old days with less information and more unknowns. But the world isn't about just me, or just about the people that hassled you. To many people, the increased information is a necessity, and it isn't up to anybody else to say it's wrong. It's the way of the world and you can either adapt or be bitter and tell people to take TRs down. Yeah, and was I ever pissed when you did that recent report from the Tatoosh. Everybody knows that 's my "Secret Stash ". This website exposes the secret stash knows as the Pacific Northwest. This local stuff is a bunch of elitest BS. Amar your a badass and I am and will continue to be proud to follow your skintrack. I really, really wish this was TGR forums right now. ... in an earlier era it was considered bad form. That is why you get push back. I enjoyed the trip report and the pictures. Although I enjoyed the relative quiet of the backcountry in the '80's and '90, more skiers has forced me to explore other areas and enjoy the amazing advances in technology that a large buying pool encourages. It is not that crowded out there. Folks need to get a perspective here and look at the big picture. I have to agree with Amar on this issue. The North Cascades belong to all of us. I want to wholeheartedly lend my support to Amar on this one, this is one of the few subjects in skiing that will really make my blood boil, and it's heartening to see the reaction of most of the rest of TAY. edited: because I thought better of posting at midnight. I'm one of the people who contacted Amar about this trip report. I did not ask Amar to remove his TR. But I explained why I was disappointed to see it and why I have chosen not to post reports about this destination. I explained my philosophy 18 years ago in a letter to the editor of Couloir. At the time, Craig Dostie was catching flak about publishing "secret spots" in his magazine. Couloir, Feb/Mar 1994, p. 2: "Don't forget joy of discovery"
As someone who writes and speaks about backcountry skiing, I too have wrestled with the question of publicizing secret spots. My solution is to recognize three kinds of backcountry places: 1) those that are already well known and accessible, where additional publicity has little effect; 2) those that are very remote, where difficult access prevents them from becoming popular; and 3) places that are accessible yet for some reason little known. I don't mind publicizing spots in the first two categories. This is how we introduce newcomers to the sport and inspire experienced skiers to expand their horizons. The last group however, are backcountry gems. I don't write about these spots or mention them in my slide shows. Although the wilderness is a big place, the number of good, accessible, little known spots is tiny and always shrinking. Some people get indignant when I decline to name my secret spots. These are perhaps the same people who demand to know everything about the private lives of public figures. My response is to assure these folks that if we meet at one of my secret spots (or one of theirs!) I'll greet them cheerfully and join them for a great day of skiing. I trust that everyone's experience will be richer for having spent the time to find these spots on their own. 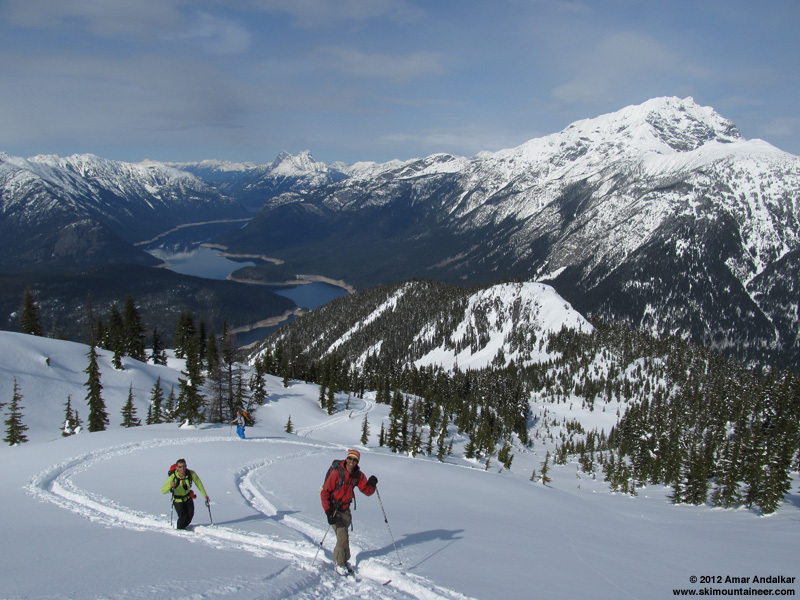 The process of discovery is one of the great joys of wilderness skiing. For me, the issue is not about powder stashes. It is about what Reinhold Messner called "White Wilderness." It's the notion that we lose something when every place is mapped and photographed and documented to the point where you can't go anywhere and experience the joy of discovery anymore.� You never experience the delight of finding a place that you never knew existed, or that you haven't already seen thoroughly photographed. It's what distinguishes the Cascades from a place like the Alps. It's what Messner longed for when he proposed the notion of White Wilderness two decades ago. 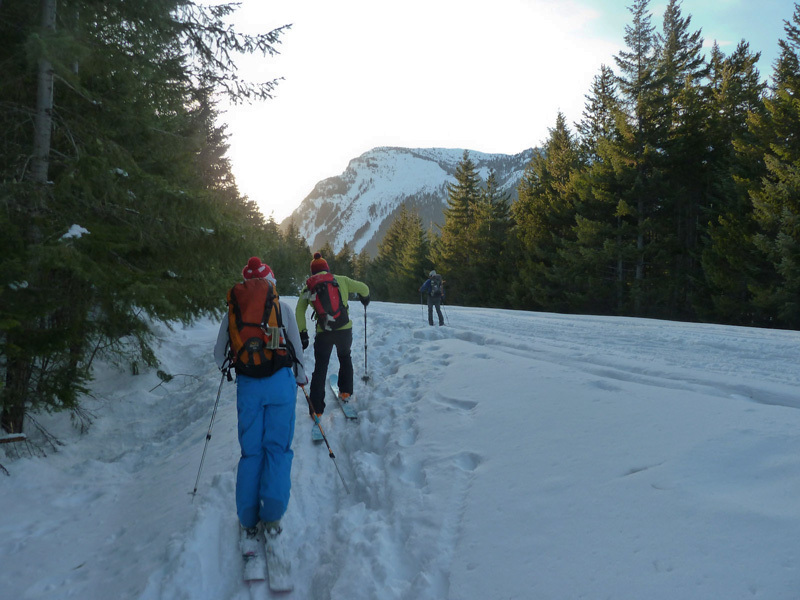 In my time skiing in the Cascades, I've found a few places like that, and as I wrote in my letter to Couloir, the ones I regard as real gems are the ones that are relatively accessible, places you can stumble upon in a day or a weekend. The number of such places diminishes every year, and with Amar's TR, we've driven a stake through the heart of another one. That saddens me. Not just for me but for anyone who might want to experience that feeling of delight at finding such a place. As I wrote to Amar, his TR reminded me of that old rock-and-roll song, "Angel in a centerfold." Only in this case, it's Ruby in the centerfold - four shots and 8000 pixels wide! 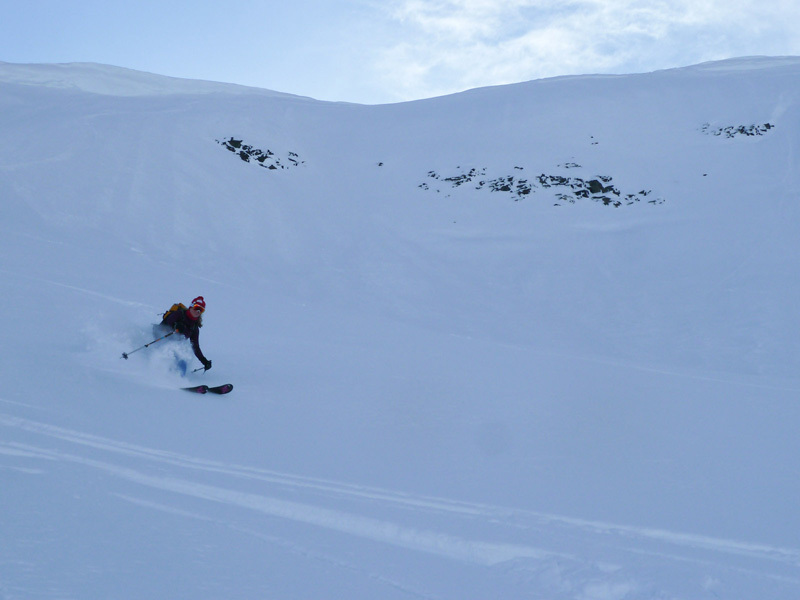 Amar has written that he feels that Ruby Mountain is destined to become a moderately popular backcountry skiing destination. Well of course it is! And my 15-year-old son is destined to become an adult who'll no longer spend much time with me. But that doesn't mean I want to speed up that process. Why not savor the little time we have? Our children and grand-children will envy us for the opportunity we have had to experience the North Cascades before every square foot is thoroughly documented. All the trends indicate that this is going to happen. Just because it's inevitable doesn't mean I want to accelerate it. You may feel differently. That's fine. I've said my piece. I want to comment on a particular point that Amar made--that increased backcountry skier traffic on Ruby Mountain could protect it from the revival of decades-old tram-building schemes. I think that's a red herring. An influential friend of mine (with ties to the Wilderness Society, REI, the Seattle business community, several philanthropic organizations--a real mover and shaker) has been lobbying for several years to build a hiking trail up Ruby from the Ross Dam parking lot. Just a trail! No parking lot would need to be built, since there's already one there. He's run into a complete brick wall. For a hiking trail! So no, I don't think we need to worry about tramways. Amar's argument on that score isn't compelling at all. I'm constantly ``discovering'' for myself things that are actually well documented in one place or another.� So this argument strikes me as a red herring in the same way Amar's argument about a possible tram strikes you. We should all applaud Amar for skiing from somewhere other than Paradise! Lowell (ok, mr. skoog to you), I love alpenglow.org, both because of the historical context it provides, and for the motivation to get out the door and push myself. 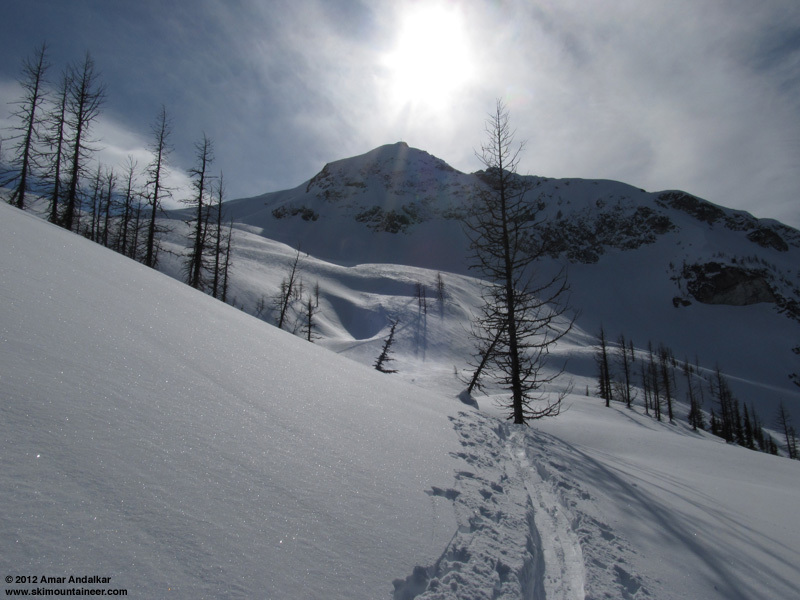 Many of the routes described on your site aren't particularly hard for a fit skier to do in a day, yet they're named, described, and in some cases "red-lined' onto photos. Is that really any different than what Amar has done? Does it make them any less of an adventure? I'd pose that in the very same way you've contextualized and facilitated some of my most memorable ski days, Amar has done the same here with a slightly less alpine peak. Thanks for sharing with the community, Amar. I always enjoy reading your TRs. First off it is nice to see Amar actually skiing somewhere other than Paradise! Sky is right about discovery. I have guidebooks, and I use them and maps to research climbs. No matter how much information I have, once I get on route it's a new experience for me. A guidbook or trip report will never tell you exactly what you will find when you go out. 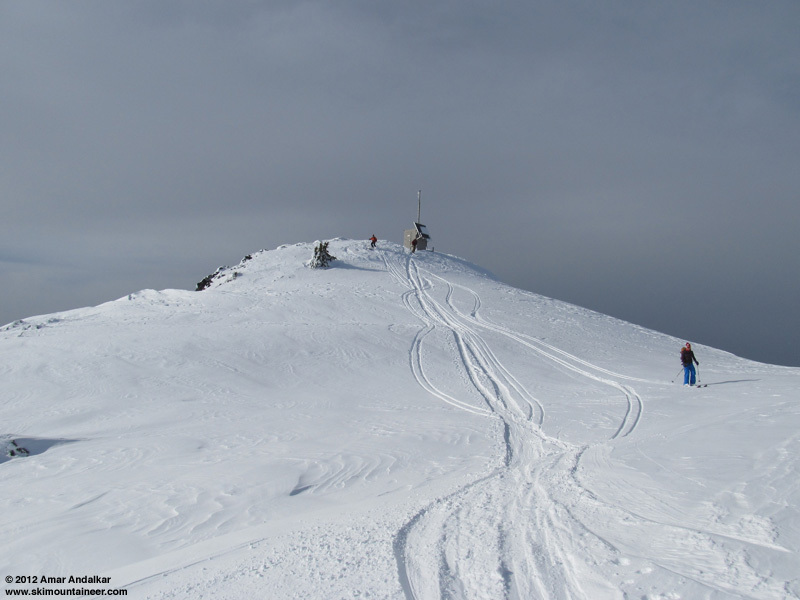 Weather and snow conditions are two of many factors that don't duplicate. You still need to figure things out. I know of this sweet Slot by Snoqualmie but don't tell anyone because it is a secret! Sorry would write more but I am training for Alaska. You raise a valid point about my historical work. 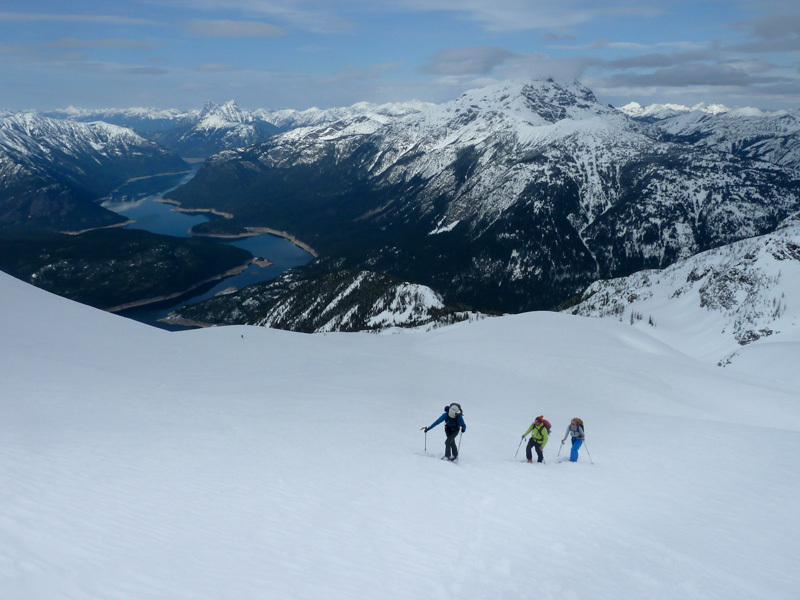 What is the difference between documenting steep skiing routes, as I have done for Mount Shuksan and Mount Rainier, and posting a photo expos� about a place like Ruby Mountain? First of all, the routes that I've recorded in my ski history project are historical milestones which (in nearly every case) have already been published by the people who first skied them. There's no evidence that the folks who've done those routes want to keep quiet about them. Otherwise, I never would have known about them! Ruby Mountain, on the other hand, is not a history-making trip. Maybe it was when Duke Watson and Tony Hovey made their ski ascent in 1967, but not anymore. So the motivation (which I feel strongly) to record and honor the human story of the Cascades is not a factor with Ruby. For me, the basic question is this: Is the mountain an arena? Or is the mountain more like a lover? The answer is different in every case, and if you are not conscious of and sensitive to these differences in the region, you shouldn't be writing either a history or a guidebook. Some mountains are clearly an arena. The major features of Mount Shuksan and Mount Rainier are clearly that. As the number of routes on those two mountains exceeded my ability to distinguish them in words, I created topo diagrams to make sure I was recording them accurately. I've gotten no complaints about that. Other mountains, I would argue, are more like lovers.� But the mountain is not a lover to one person alone.� Each mountain has a relationship with many people.� So when I choose to write about a place, I try to keep in mind the sort of relationship that it may have with others. That's how I came up with the criteria I described in Couloir magazine.� Is the place well known and accessible, remote and inaccessible, or accessible yet for some reason little known?